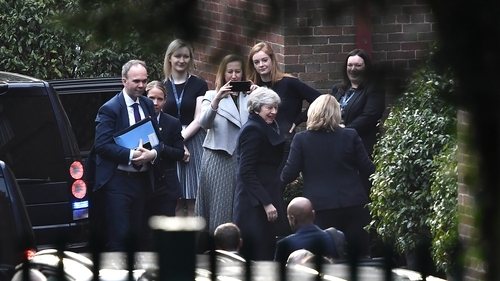 British Prime Minister Theresa May faced competing demands to both purge and protect the border backstop as she met Northern Ireland's political leaders. Mrs May held talks with the five main Stormont parties in Belfast today as she continued efforts to salvage her troubled Brexit deal. The backstop provision of the Withdrawal Agreement would see the UK tied to a customs union - and Northern Ireland additionally bound to some single market regulatory rules - if a wider trade deal fails to materialise by the end of the Brexit transition period. The DUP and Ulster Unionist Party are vociferously opposed to the mechanism, insisting it would create an economic border between Northern Ireland and the rest of the UK. Sinn Féin, the SDLP and the Alliance Party - all Remain advocates - argue the backstop is the only way to maintain a free-flowing Irish border post-Brexit. DUP leader Arlene Foster, whose ten MPs prop up the Conservative Government at Westminster, led her party's delegation for the meeting with Mrs May at Stormont House. She again insisted the backstop was the "main problem". "We want a deal which respects the union and the referendum result," Mrs Foster said. "Our message was very simple. The draft Withdrawal Agreement is flawed because the backstop would undermine the economic and constitutional integrity of the United Kingdom. "It is welcome that the prime minister is travelling to Brussels to seek changes, but she must stand strong and by the commitments she made to the House of Commons. "We want a deal. One that works for us as well as our neighbours in the Republic of Ireland. But we must face reality. There is no 'agreement' unless it is able to command the necessary support in Parliament." Mrs May heard a different message from Sinn Féin. Party president Mary Lou McDonald said the backstop remained the "bottom line". "That has consistently been our position, that is the position of everybody across Irish public and political life, with the exception of the DUP," she said. Mrs McDonald accused Mrs May of coming to Belfast with "no plan, no credibility and no honour". "We have told her that the British strategy of running down the clock and playing a game of chicken with Ireland and Irish interests is profoundly unacceptable and wrong," she said. "We have told her that the backstop is the bottom line, the bare minimum requirements to meet Irish interests, to protect the Good Friday Agreement, to prevent a hardening of the border, to in some way mitigate citizens' rights. "We have told her that pandering again to the DUP is wrong on every level and we have reminded her that the DUP do not represent the views of the people of the north of island, or indeed the island as a whole." Last week, MPs backed an amendment that advocated the negotiation of "alternative arrangements" to replace the backstop. Yesterday, on the first day of her two-day visit to Belfast, Mrs May suggested she would be seeking to change the backstop - perhaps with the insertion of a time limit - rather than ditching it completely. SDLP leader Colum Eastwood said Mrs May needed to understand there was no alternative to the backstop. The meetings at Stormont came amid the ongoing power-sharing crisis at Stormont, which has led to no properly functioning devolved government for two years. Senior civil servants are running public services, with the Westminster Government reluctant to introduce direct rule. UUP leader Robin Swann, who is also opposed to the terms of the backstop, said Mrs May must impose Westminster rule if there is a Brexit no deal. "She has to put direct rule in place come 30 March because Northern Ireland needs political leadership and it needs political direction," he said. Mr Swann claimed Mrs May appeared reluctant to talk about efforts to restore power-sharing. "The conversation we were having with the prime minister was initially about Brexit, we had to drag her to a place where we actually started to talk about how we get these institutions back up and running," he said. Alliance Party leader Naomi Long expressed her impatience at what she termed a lack of progress in the two years since the UK voted to leave the European Union. "That is the only thing that is actually going to reassure the public, it is the only thing that is going to reassure business, and it is the only thing that is going to reassure those of us in politics who are concerned about what is going to happen next. "This is not about political philosophy, this is about people who live in Donegal and work in Derry, this is about people who live in Newry and work in Dundalk. "This is about people being able to do their jobs, it's about workforce planning in our health service, in our schools, it's about all of those things. It's not about philosophical debates in parliament."